It's Monday morning and I'm in the centre of Bronte Park. Sunlight tiptoes through the foliage, the perfume of wild plants drifts through the air, and the only form of tweeting is from enthusiastic birds. It's a great way to start the working week. I'm here to forage for wild food with award-winning chef Matt Stone, who is in town for a few months to helm East Sydney's Stanley Street Merchants. Stone, 27, is decked out in thongs, shorts and a flannelette shirt partially concealing a sleeve tattoo. He carries a calico bag printed with the MAD Symposium logo, the annual uber-hip chef-meet founded by Noma's Rene Redzepi. Redzepi is something of a demi-god to a group of young international chefs sourcing ingredients outside the farms and markets dictated by convention. Beaches and creeks, paddocks and footpaths, wide-open fields and other people's front yards - anywhere there's native or introduced flora that can be plucked, prepared and plated. Their philosophy is simple. Wild-growing weeds should not be ignored or cursed at, as we have done for generations. Many are plants that should be celebrated and enjoyed. Stone bounces across rocks, logs and creeks, pointing out patches of mallow, chickweed and native violet. They're the kind of plants as common to parks as frisbees and first-aid-inducing swing-sets. The ones most of us trample on the way to the bubbler. But Stone isn't trampling over them. He's scouring the ground with a mind racing at culinary possibilities. "These nasturtiums you can make into a paste and pair with some octopus," he says. "This sorrel I'll use as rocket substitute. And spinach can be subbed for that mallow." Picking other plants growing nearby and discovering how well the flavours work together is one of the great things about foraging. Nature is more than apt at suggesting flavour combinations, Stone says. "Picking other plants growing nearby and discovering how well the flavours work together is one of the great things about foraging." Stone's love of urban foraging is shared by Diego Bonetto, an infectiously happy Italian bloke known as "the Weedy One". "Weeds are co-evolutionary species," he says. "They're here today because of us. Because they adapted to us and exploited the way we interact with the environment. Where there are weeds it is because humans are there or once have been - in ethical terms, they are our botanical brothers and sisters. So everyone stop hating them!" Bonetto regularly takes members of the public on wild-food foraging expeditions to Cooks River in Tempe. Over the course of a morning, participants learn how to identify edible weeds and use them in the kitchen or as natural remedies. He has imparted his enthusiasm and knowledge to many a chef in Sydney, especially when it comes to advice on making weeds transition from edible to actually tasting good. Outside of the primary-school athletics carnival when you were five, ever pull something out the ground and shove it straight in your gob? The results can be decidedly variable. "Some plants speak for themselves," Bonetto says. "Others need a bit more coaxing to make them palatable. It's also about educating people." Waterloo's Studio Neon is all about customer education. Aaron Teece cooked all over Sydney, including Manly Pavilion, Felix, and est., before opening Studio Neon in 2011. Part studio-for-hire, part event space, Teece and head chef Richard Robinson (ex-Momofuku Seiobo) also host monthly cooking classes and fortnightly "Unearthed Dinners", showcasing foraged ingredients. "We use foraging as a means of keeping in touch with nature and keeping on the pulse of what's in season and the speed at which things are changing," Teece says. "With our chevre [goat's cheese] and wild weeds dish, we try to use ingredients similar to what the goat would be grazing on at the time. We often find these same flavours coming through the cheeses as the seasons change." I attended the "As Autumn Leaves" dinner at Studio Neon and loved it. Byron Woolfrey, from mobile cocktail service Trolley'd, was responsible for drinks on the night. He is another big champion of wild food in Sydney, using foraged natives in the Trolley'd drink creations. "Our go-to drink is Lemon Myrtle Lemonade," Woolfrey says. "It has a great flavour, and there's lemon myrtle trees growing all over the streets." So that's settled, then. Everyone - grab a calico tote and follow me. Or maybe not. Foraging sounds like jolly good fun, but if every part-time Don Burke starts digging up dandelions we won't have any left, right? I posit this to the weed-loving Bonetto. "Oh, no," he says. 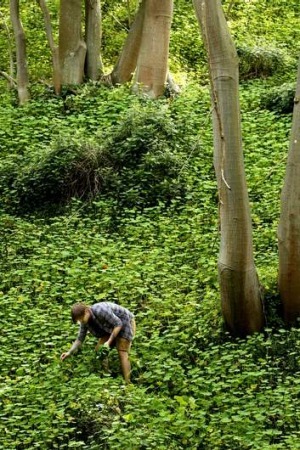 "Urban foraging is not sustainable. It is gastro-entertainment." Gastro-entertainment. A fantastic term and something that should be enjoyed with care and respect. If you do want to forage for wild food in your neighbourhood and local bushland, then forage like the animals and only take as much as you need. Bonetto says the best thing to do is explore your own yard for any weedy gifts. You'll be surprised at the value those pesky weeds and unassuming nasturtiums have in the kitchen - it's the culinary equivalent of discovering those old Archie comics under the stairs are actually worth a mint. Or in this case, a mint substitute. Bonetto even stumbled across a front yard recently where common weed was being grown, not ripped out and destroyed. "I was walking in Marrickville and there was this old Greek dude working in his garden growing flatweed. So I stopped and chatted for a bit. He said, 'This is good stuff. We boil it, put a bit of oil on it, a bit of lemon. It's good for you!'" Owners of weed-fertile lawns, beware. You may find yourself the target of renegade foragers. I asked conservationist and Bonetto collaborator Adrian O'Doherty where the borderline was when it came to foraging in other people's yards. "Legal," points O'Doherty to some leaves hanging over the fence of a Newtown terrace. "Illegal," he says, pointing to plants on the inside. "It also depends on how coy you are in terms of asking for permission," he says. Even if the plant is hanging over the fence, I think requesting permission from the owner is the right thing to do. If you do forage for wild food around your neighbourhood, the Wild Food Map created by Bonetto and O'Doherty promises to be a useful tool when it is released closer to September (until then you can request use of the prototype version from the Wild Food Map website). With the power of social media and Google maps, users can photograph wild food around Sydney and then map the pictures to a location. Stumble across a healthy bunch of lilly pillies in Redfern? You can let other foragers know exactly where. Alternatively, if the sorrel crop at Bronte is looking depleted, you can use the app to alert users it needs time to regrow. Importantly, it also provides information to assist in positively identifying wild plant species. Yes. Plant identification. I don't know about you, but put some cobblers' pegs, nettle and lantana in a line-up and I'd be hard-pressed to tell the difference. Fine in a restaurant where I trust the chef, but if I'm foraging these myself, how can I be sure I'm picking safe, edible food? It's pretty simple, really - if you're not sure, don't eat it. "Contact someone who knows what they're talking about," advises Studio Neon's Aaron Teece. "It's important to be completely knowledgeable when foraging." The "if in doubt, go without" rule applies tenfold when it comes to mushroom foraging. As you've made it this far in life, then you know that eating mystery mushrooms is about as safe as a tango with a scorpion. However, mushroom foraging is a lot of fun once you know what you're doing. The pine forests of Oberon in the Greater Blue Mountains have a wealth of wild mushrooms that are ripe for the picking between late February and early May. The Oberon Visitor Information Centre provides directions and an identification leaflet so you can tell your slippery jacks from your saffron milk caps. It also recommends that any novice seeks out an experienced mushroomer for in-the-field guidance. The Oberon info centre might be able to point you in the direction of a such a sage, and Bonetto also takes groups down to the Belanglo and Penrose state forests in wild mushie season. Alex Elliott-Howery and James Grant, the husband-and-wife owners of Marrickville's Cornersmith, recently took their staff on one such trip. "We had an amazing time," said Elliott-Howery. "Sabine [one of the Cornersmith chefs] made awesome pine mushroom schnitzels that we ate with labna, pickles and Young Henry's cider. We then took a car boot of mushrooms back to Sydney for pickling, preserving, and dehydrating for seasoning salt." Urban foraging may become more community-driven in the future. Joey Astorga from In the Annex notes an increasing trend of customers donating edible plants and weeds to the kitchen. "There's a place around the corner with stacks of wild fennel in their front yard," he says. "They had no idea what they were sitting on until we told them and now they're happy to bring it into the shop and we use it in dishes." Elliott-Howery says some Cornersmith customers don't want anything at all, while others might trade their crop for a cup of coffee or maybe a jam. Whether wild food and urban foraging is a permanent part of a culinary landscape, or merely a cool-kid trend remains to be seen. Trend or no trend, Matt Stone and his contemporaries are cooking beautiful, seasonal and delicious food that if you haven't tried already, I encourage you do so. And have a poke around your own yard and neighbourhood to see what weedy gems are begging to be your dinner that night. A morning spent in Bronte traversing creeks and moss beds on a hunt for nasturtiums is a thousand times more enjoyable than swiping a depressed bag of rocket through the fluorescent-lit beeps of a self-serve checkout. Native violet A ground-covering plant that loves shadows and moisture. High in vitamin C, both the heart-shaped leaves and sweet flowers are great in salads. Chickweed This tangled mess with the occasional white flower can be found in lawns all across Australia, especially in winter. It has a gentle taste, and Matt Stone recommends using it in place of rocket. Mallow It's abundant in autumn and a fan of sunny spots. Stone suggests using mallow as a spinach substitute. The leaves also contain mucilage, making them good candidates for thickening soups. Nasturtium A shade-dweller that flowers in red, yellow and orange from spring to autumn around Sydney. The leaves have a nice watercress flavour and the flowers make an attractive garnish. Bonetto suggests pickling the unripe seeds and using as a caper substitute. Warrigal greens Found around sand dunes and coastal areas and more than just a spinach substitute, this hardy native has a unique taste all of its own. Warrigal greens contain harmful oxalic acid, so a good blanch is needed before eating - be sure to discard the water, too. Nettle One of the sexiest foraged ingredients, popping up in pastas (it makes fantastic pesto) and braises the world over. Wear protective clothes and gloves if you're heading out on a nettle hunt - those fine little hairs pack quite a sting. Cooking the leaves neutralises the sting so they're safe to eat. Nettle loves rich soil and tangled, thickety environments. Wild Mustard Aaron Teece of Studio Neon reports this plant grows wild absolutely everywhere. 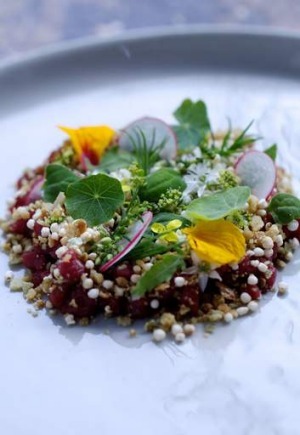 For Studio Neon's dish of wallaby tartare with red pepper caramel, seeds, grains, and wild weeds, Teece used the yellow flowers and young leaves of wild mustard. "As the leaves get bigger they take on a really bitter taste. If you are going to eat them raw they need to be young when they can be added to salads for just a hint of pepper," says Teece. Sow thistle Adrian O'Doherty from the Wild Food Map says this abundant weed is hugely revered in New Zealand by Maori (where it is known by the name puha) and cooked in stews with pork bones. Yet here it is just completely ignored. Dandelion Perhaps the most famous of all weeds. When not carrying the blown wishes of children in the wind, the dandelion is an all-edible wonder-weed. The leaves can be dried and used to make tea, and if you're so inclined, the roots can be used as a parsnip substitute or roasted and ground into caffeine-free coffee. Flatweed These guys are rampant across every bit of terrain from coastal land through to alpine areas in Australia. Bonetto suggests using the young leaves raw or cooked as you would spinach. It is rather bitter, and the older leaves can be used in winter soups. 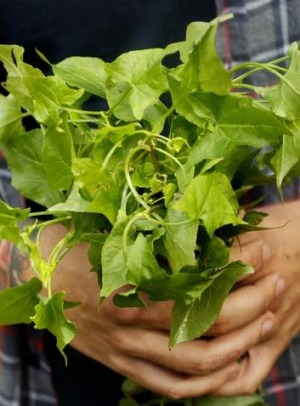 ● See what edible weeds are in your own yard before foraging at other locations. ● Thoroughly wash any finds before eating. ● Experiment in the kitchen. Have fun making pastes, preserves, chutneys and salts. Not all weeds taste great straight from the ground. ● Share information with other foragers. ● ALWAYS check with the council or landholders that it's sweet to remove plants from the land you're foraging. ● Pick something if you're even the slightest bit unsure what it is. ● Forage a patch to the point it can't regrow. ● Don't take ANYTHING from national parks (except your own rubbish). ● Expect to live on foraged weeds alone. Stanley St Merchants, 78 Stanley Street, East Sydney, 7901 0396, iconpark.com/stanleystmerchants. Trolley'd, 0406 837 907, trolleyd.com. For information about Diego Bonetto's edible weed tours and the Wild Food Map, see weedyconnection.com.